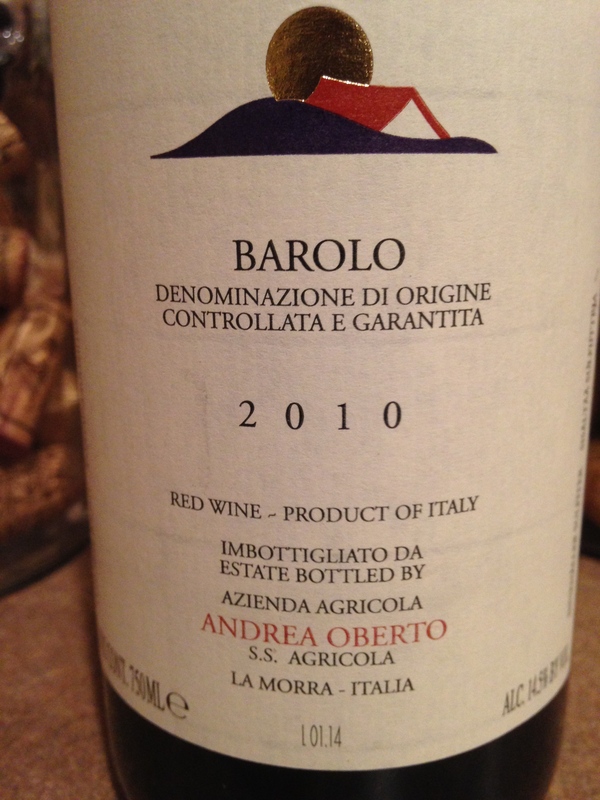 My second try at the Andrea Roberto Barolo. Murky, dark and a touch cloudy. The nose offers up raisin, black cherry and a woodsy note. The palate is smooth, tannic and very juicy with black fruits, tar, lapsang souchong tea. The mid palate has a really full mouthfeel, almost syrupy. Black berry reduction, more tea, black this time, and creosote hit the gums. The finish is long, alluring and chock full of dark, brooding fruit, gum searing tannins and teeth staining purple goodness. 92 points and still young. $40 now, it gets 4 stars. Salut…. A gift from a neighbor, I was not sure what to expect. A slight bricking on the edges of an otherwise pale purple sheen. On the nose, a beautiful bouquet of mushroom, cherry and bacon. On the palate, strawberry, cherry and upfront tannins. The mid palate reveals more cherries, but darker this time. The tannins are really starting to grip and the wine finishes very dry indeed. The gaminess I sensed on the nose has all but disappeared, taken over by brutish tannins. This is not a delicate wine, nor is it very fruit forward anymore. But it is good. In its own way, this wine exudes power and poise at the expense of fruit and finesse. I am going with 91 points for this $50 wine. 4 stars. Salut…. Slight bricking on the edges with a coppery tint in the glass. A delightful nose of cherry and earth. The first taste is sour cherry and green peppers. The acidity that this wine opens with carries on through to the mid palate. Right now it is one dimensional. There are some good tannins that round the wine out but to be honest it is too young. 89 points from me and pretty much a pass unless it shapes up and gets a little bit of flab, some more fruit and a little less acidity. This may happen if it gets some bottle age and nature is kind. 2 stars from me. Salut…. Having said all that, here is what I have gleaned from the pros. WE 94, WS 92, JR gave it 16.5 out of 20 but her drinking window was 2016-2034. I don’t think I have the patience to cellar this gem for that long, plus I feel it is ready to start enjoying now. It is crisp and fruity, yet with melded tannins that don’t overpower. A well crafted wine that I really enjoyed with a huge bowl of pasta with meat and sausage marinara. Garlic bread was involved of course! This wine can be found for $41 and I need to up my star rating to reflect the pro’s recommendations. I have to go with 5 stars. Salut…. I sometimes find myself writing basic notes and then forgetting about the wine until many days, and several bottles later before I post to the blog. It makes it hard to put pen to paper and relive the wine after a period, but this one was different. I wrote several lines of notes and after reading them I could almost taste the wine again. It had a thick purple appearance with a nose of plums, cocoa, pomegranate. Smoke, iodine, plum jam, blueberry preserves and eucalyptus all exploded on the palate with crispy acidity and generous tannins. An interesting taste/mouthfeel combo that kept me coming back for more. There was a lovely oregano hint on the longish finish. Served with lamb shanks, it was the perfect combination. I noted that is had ‘Bright fruit, Napa ringer’. I can’t wait to see the other bottles evolve, it’s going to be magic for this 92 point effort. Some of the pro’s went as high as 95 on it, we shall see. You can find it for about $35, making it a solid 4 star wine. Salut…. Now that’s a long name! Tasty wine, perhaps a little young and definitely built for the long term. I am relatively new to Barolo’s, they present themselves as big brooding monsters that cost an arm and leg, need years of cellaring and present a minefield when trying to pick one. This one is no exception, at 6 years of age, still a pup. Bing Cherries on the nose, it presented itself as a deep purple offering. I sensed some spices, perhaps cloves and lavender. Intricate tannins, very fine grained were the first impression on the palate. The cherry component came through with some Cola and Kirsch. It is very possible that this wine will come out of its youth and present itself with some great secondary flavors, I’d give it 5 more years to find out. Presently, it is a good wine, with the structure to pair with Ribeyes or a Spaghetti and Meatballs dinner. The price is decent at about $37, which for a Barolo is a steal. Going forward, I think it is a 91 pointer with perhaps 4 stars after you give it some cellaring time. Salut…. 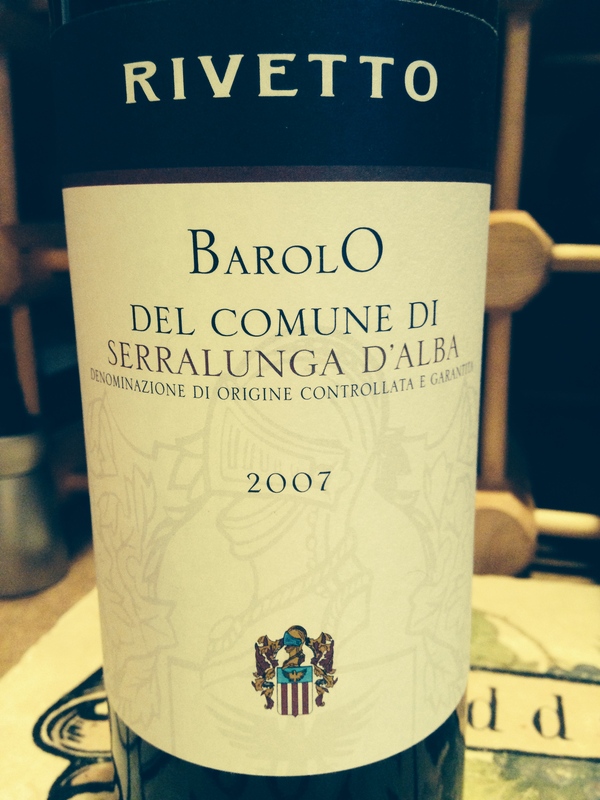 I love Barolo, but not this one. Confusion comes to mind when I try to review this wine. 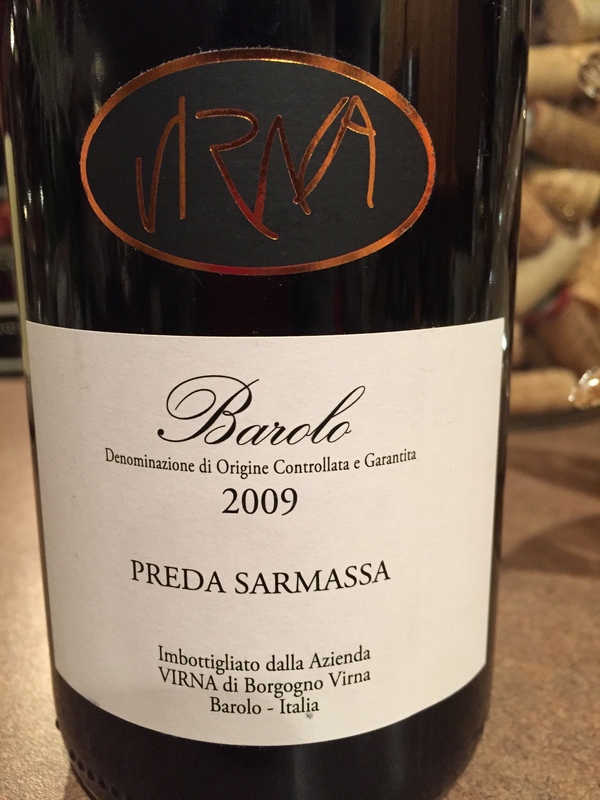 To me, Barolo is a very unique wine made from Nebbiolo grapes that produce an amazing, powerful wine with a tannic structure sure to make an ageworthy wine. Considered ‘the king of wines and the wine of kings’, it is never cheap, thin or meant to be drunk young. With seven years of age, I was figuring this would be a tannic monster that was going to stain my teeth and give me a mouth full of the Nebbiolo I was looking forward to. Not so. The tannins were all over the place, I couldn’t quite place the structure, nor could I get any sort of flavor profile. I have drunk old Barolos that have taken on the secondary flavors and lost their tannic grip, they taste like aged Burgundy – beautiful. 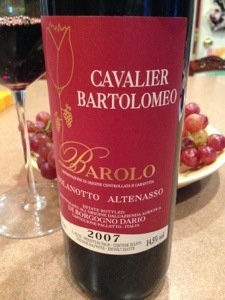 I have tasted young Barolos and enjoyed the tannins because the primary flavors of the grape are so intriguing. This bottle offered neither. Could it be that I hit it in it’s ‘mid-life’ crisis? Stuck between the young monster and the old, graceful charmer? Not sure, but I have had this bottle before and remember that it was too young, hence the need to try it again this year. I will continue to cellar the remaining bottles and open one in a year or so to see the results. Perhaps it just needs more time, but I am not holding my breath. It just doesn’t seem balanced, lacking in either primary or secondary fruit and has a very uneven mid-palate. I retasted it after several hours and albeit slightly better, there was nothing in it for me. Very disappointing and only worthy of 1 star at this point. I had to see what others are saying about this bottle, and the consensus from ordinary peeps like me on the web indicate my hunch is right. I suggest decanting for several hours to try and coax something out of it. PS It got a massive 92 point rating from the big boys and the regulars like me gave it between 87 and 90. My estimate- 85.